Pinnacle Signs & Graphics, LLC. 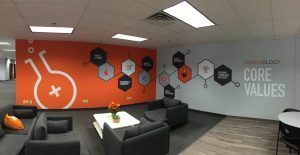 is your local provider for attractive, high-quality wall graphics. 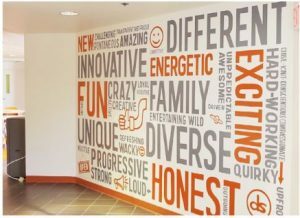 Ideal for business use, wall graphics and murals can turn a long hallway into a lesson on the history of your company, add color and excitement to an otherwise boring wall, or can allow you to proudly display your logo in your office lobby. Pinnacle Signs & Graphics, LLC. creates custom wall murals that are specific to your business, branding, and space. We use high-quality, durable vinyl to create eye-catching and attractive wall graphics and wall lettering that can say or display anything you can image. 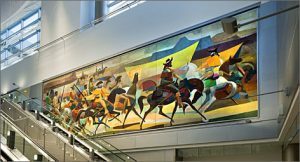 From breathtaking, large-format landscape murals to individual wall decals that together tell a story, we handle it all. Pinnacle Signs & Graphics, LLC. uses only the highest-quality materials, allowing you to be confident that your wall vinyl will not only be durable and long-lasting, but have an attractive finish, with options ranging from high-gloss to matte, that is suitable for the placement within your facility. While vinyl can be self-installed, for the smoothest finish and best results, it is best to have a professional vinyl installer place your artwork. 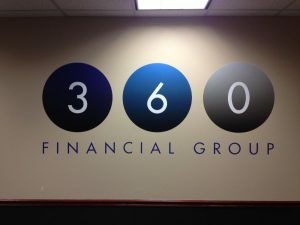 While small graphics typically have very few issues, large sheets of vinyl can be challenging to work with, often resulting in bubbles, small rips, or creases creating a less than professional appearance. When you work with Pinnacle Signs & Graphics, LLC., if there are any issues that arise during our expert installation, such as damage to the vinyl, we will replace it free of charge. If you damage the vinyl during self-install, we would not be able to uphold that same warranty, making professional installation of large-format vinyl graphics a must. Call Pinnacle Signs & Graphics, LLC. at (719) 428-6274 for a Free Consultation with a Wall Graphics Expert!